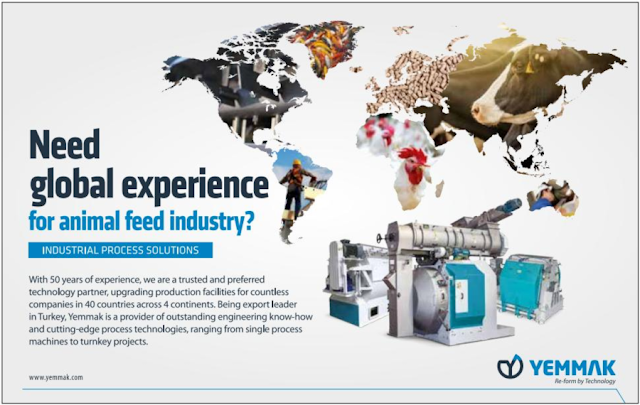 Established in 1965, Yemmak is Turkey's leading feed machinery manufacturer, providing industrial process solutions for the animal waste processing, chemical and biomass industries. Through its deep industry experience spanning over half a century, Yemmak exports to 35 countries on four continents, and provides services in project consulting and engineering, special-purpose projects, automation, modernization, steel construction and after-sales support with a 250-strong staff lead specialist engineers at its 50,000 m2 area plant in Bandırma, Turkey. Yemmak is among the few producers in Turkey and Europe that can manage machinery, process and turnkey projects from a single centre. Yemmak recognises the key role of advanced technology in improving Turkey's prospects and believes R&D investments are crucial in this regard. As a global brand, Yemmak exports 70 percent of its products to 35 countries including Egypt, Iran, Iraq, Syria, Israel, Lebanon and the rest of the Middle East; Azerbaijan, Turkmenistan and all other Turkish republics; and Russia, Ukraine, Armenia, Sweden and Panama. Providing low energy costs, the design, production, and assembly operations of the company are of high quality, selection, reliability, and efficiency. Yemmak reshapes production through environmentally friendly, sustainable and innovative technologies. Visit the Yemmak website, HERE.